I hear that some people get tired of leftovers. I am not really one of those people. To me, leftovers equal free time because the cooking is already done! Nevertheless, your pots of Black Beans with Cilantro and Lime and Quinoa with Corn, Green Onions, and Feta are probably starting to dwindle, now that you made those Black Bean Tacos and snuck a scoop of the beans for your Huevos Rancheros. This week’s leftovers have their last hurrah in this taco salad, which could be dinner on a busy night or could just as easily travel to work for lunch. Of course, you can make make this salad with any cooked or canned beans and grains you have on hand. Or substitute a good handful of broken tortilla chips for the quinoa–I won’t tell. Vegetarian Taco Salad: For each serving, shred a big bowl of lettuce (preferably romaine, but here I used up a head of red leaf lettuce and it was fine, just fine–use what you have, remember?). Top with shredded cheese, a scoop of beans (seasoned beans are good, but plain are fine too) and a scoop of rice or quinoa. Diced veggies such as tomato or red pepper (or corn, if it’s not already in your quinoa) would be welcome here as well. Top with salsa, sour cream, and avocado slices. If your beans aren’t already full of cilantro and lime, both would be good sprinkled in your salad upon serving. This entry was posted in Beans and Other Legumes, Easily Multiplies to Feed a Crowd, Mexican Flavors, Salads, Vegan or Would-Be-Just-As-Good-Vegan and tagged beans, cooking, dinner, DIY, family, food, homemade, lifestyle, recipes, salad, vegan, vegetarian on March 14, 2012 by emmycooks. Love the leftover quinoa idea for this! Brilliant! I only get tired of leftovers if I can’t think of something new to turn them into. This looks delish! I agree about the leftovers. And I love recipes that include ideas for using up leftovers. I’m trying to sometimes illustrate how I cook over a series of posts, showing how I use a recipe over the course of a few days–as do most home cooks, I think! Looks awesome – and super food spectacular! 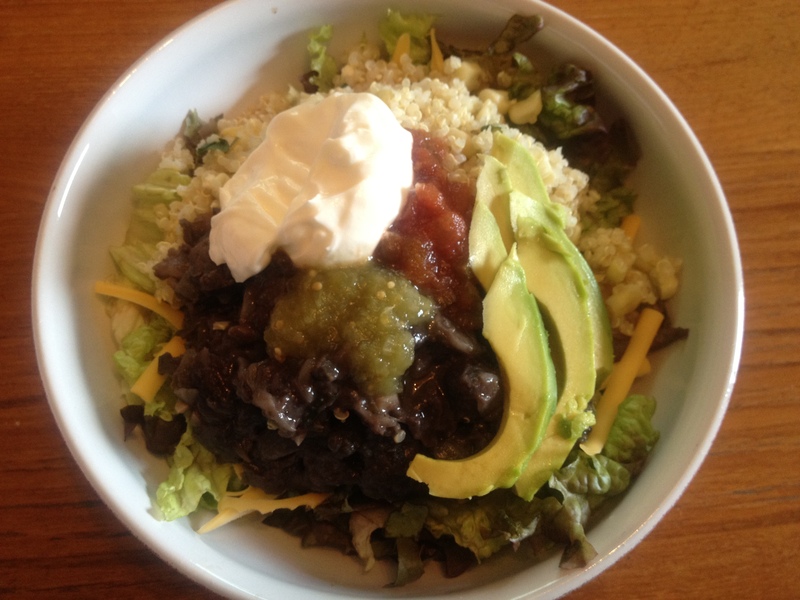 I love quinoa cold in salads – amazing! I love quinoa salads, too. There’s one that lives on in my memory from a long-defunct vegan restaurant in Seattle. I should try to recreate that. What are your favorite quinoa salads? I’m always looking for a good one! I love the way you make such full (and obviously tasty) use of leftovers! Sad to say, I’m somewhat of a leftover failure. I often find them in the back of the fridge in a state best suited to scientific research. I will try to take inspiration from you! Oh, that DEFINITELY happens to me as well. I’m always disappointed when I find something that used to be delicious…and now isn’t fit to feed the chickens. But when I plan ahead to use leftovers, I’m more likely to remember!